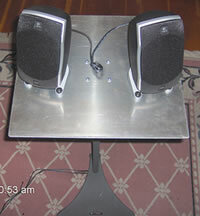 Gary posted a great method for mounting the Logitech Z5500 speaker system on his PSR-3000. Here's my solution. 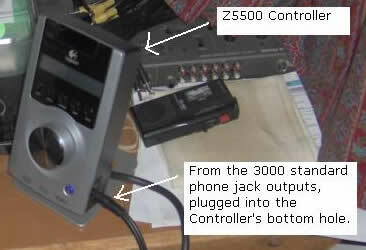 Speakers and the Controller were connected to the subwoofer as indicated in the Z5500 instructions. A stereo cable runs from the Controller to the PSR3000 where it splits into two separate Left and Right connections where an adapter is used to convert the 1/8" connection to a 1/4" connection. First, I purchased two inexpensive Walmart speaker stands. The next step was to assemble the mounting bracket on the stands and feed the wiring up through the shaft. I then went to Ace hardware and bought 4 screws, 4 flat washers, 4 lock washers and 4 nuts. The next stop was a local machine shop where, for $20, I bought two pices of sheet aluminum (1/8" x 14" x 15"). 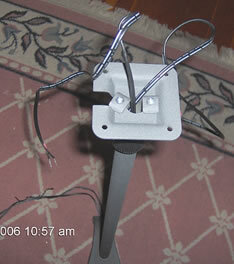 These aluminum pieces were then mounted to the bracket on the stand. 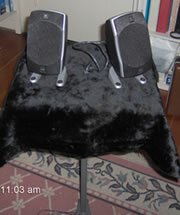 Two speakers were then attached to each stand (figure 4). Finally, I added a piece of velvet (found at a local thrift store for $0.50) to finish the stand (figure 5). On the Controller side, the cable plugs into the side of the controller. At home, the volume is set to default. At the casino, the volume usually is boosted up to about an 8 or 9 boost.